TAGLaw has been featured in a recent article by Lawyer Monthly about the Hong Kong International Conference. International Trade, Asian Markets, Cultural Protocols and Crowd Funding were among the topics covered at the event. Read the entire article at Lawyer Monthly. A recent article by The Global Legal Post entitled "TAGLaw Meets in Hong Kong" reports that some 35 countries have been represented at the 31st TAGLaw international conference in Hong Kong. Read the entire article at The Global Legal Post. Now the third largest firm in the state of Nebraska, Koley Jessen has more than 60 lawyers serving from its Omaha and Lincoln offices. The firm's clients are individuals and businesses, ranging from start-up companies to mature public companies and from service companies to manufacturers. International Trade, Asian Markets, Cultural Protocols and Crowd Funding among the topics covered. 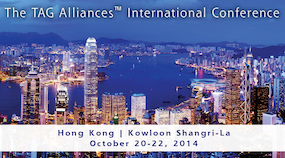 Hong Kong (October 20, 2014) - The international alliance of independent law firms, TAGLaw®, will hold its 31st international conference from October 20 through 22nd in Hong Kong. "TAGLaw Adds Bufete Escura in Barcelona"
Below is an excerpt from a recent Lawyer Monthly article featuring TAGLaw's and new member firm Bufete Escura in Barcelona. "The addition of Bufete Escura in Barcelona, combined with our existing member in Madrid, B. Cremades y Asociados, means TAGLaw members and their clients will have access to the highest quality legal representation throughout Spain," said Robert Sattin, President of TAGLaw. "The continued growth of TAGLaw demonstrates how important it is for law firms to have international coverage in the continuously changing global marketplace." "TAG Alliances - being successful in a changing world"